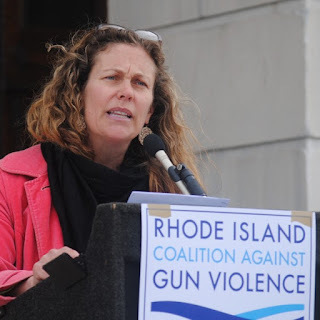 STATE HOUSE – Domestic abuse victims in Rhode Island need and deserve better protection from armed abusers, Rep. Teresa Tanzi told a crowd of supporters at a Rhode Island Coalition Against Gun Violence rally at the State House last week. 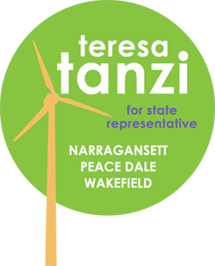 Representative Tanzi (D-Dist. 34, South Kingstown, Narragansett) is the sponsor of legislation (2016-H 7575) that would require anyone convicted of a domestic abuse misdemeanor and anyone subject to a domestic abuse protective order to surrender any firearms they have and would prohibit those abusers from acquiring more. The rally was organized as a show of support for that legislation, a related bill sponsored by Rep. Gregg Amore (D-Dist. 65, East Providence) and legislation to prohibit possession of guns on school grounds. Representative Tanzi spoke in support of protecting victims of domestic violence, and noted that Rhode Island is “falling behind the rest of the country” in terms of enacting common-sense gun measures that protect its citizens. Currently, courts may order those subject to domestic abuse protective orders to surrender guns, but are not required to do so. Between 2002 and 2014, 1,609 protective orders were granted in Rhode Island, and judges ordered abusers to surrender weapons in only 5 percent of those cases. Representative Tanzi’s legislation would require abusers to surrender firearms at the time of their convictions, and temporarily surrender them upon the granting of a domestic abuse protective order. She noted that the change would bring Rhode Island law in line with existing federal law, and further protect victims by requiring the surrender of firearms the abuser already owns – a loophole that federal law does not currently address. “I will continue to fight for you — and for Rhode Island children, women and families — until we pass these vital pieces of legislation,” she told supporters at the rally. IN PHOTO: Rep. Teresa Tanzi (D-Dist. 34, South Kingstown, Narragansett) addresses supporters at a Rhode Island Coalition Against Gun Violence rally last week.